During the 1840s, there were hundreds of Utopian communities in the United States based on ideas developed in reaction to the Industrial Revolution. Although there were major differences in the purpose and organization, these religious and secular groups all shared a vision of communal living in a society that ensured prosperity for everyone. 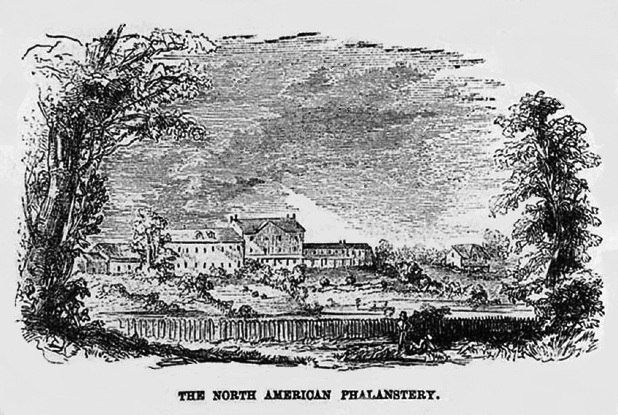 Although none of them was able to create an ideal world, one of the most successful communities was the North American Phalanx, a non-sectarian association established near Red Bank, New Jersey in 1844. Based on the theories of French philosopher Charles Fourier, the Phalanx (as it was simply called) was opposed individualism, believing that the efficiency of labor could be improved through harmonious cooperation.1 Given its custom of sharing food in common, it was surprising to discover that this socialist community suddenly began printing daily menus, as evidenced by a rare survivor from 1855. 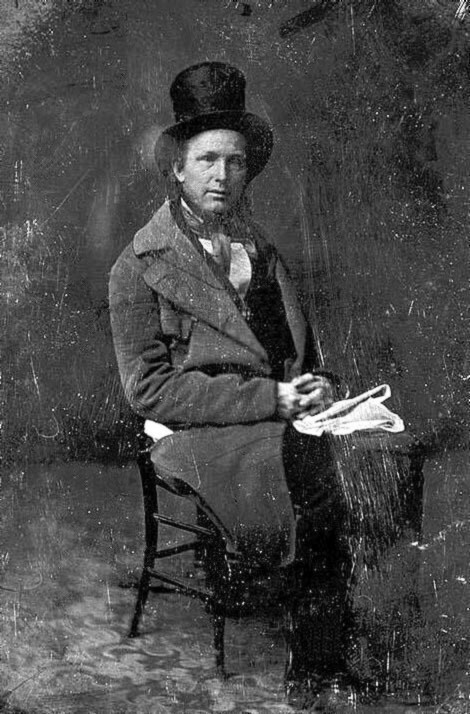 Horace Greeley, publisher of the New York Daily Tribune, was a staunch supporter, helping the association purchase land in rural Monmouth County. The most prominent feature of the settlement was the “Phalanxery,” a 150-foot long structure that contained living accommodations, a communal kitchen, and a dining room that was also used for dancing, theatricals, and lectures. Other facilities on the property included a gristmill, forges, carpenter shops, a “progressive” school, guest cottages, landscaped gardens, and a pond for bathing, boating, and ice harvesting. Situated twenty-five miles south of New York City by water, the association used steamboats to transport its garden produce, hominy, and breakfast cereals to market. All of the products were marked “NAP,” making it one of the first brands in the country. During its twelve years of existence, there were about 120-150 people living at the commune at any one time. Most came from working- and middle-class backgrounds in the urban Northeast. Women who joined were accorded the same rights and wages as men, freeing them from the continual drudgery of housework, or working in the mills. In fact, the Fourierists believed that its members should have enough time for intellectual pursuits and recreational activities. The meals at the Phalanx were served by young women dressed in bloomers, a Turkish-style trouser worn under a full skirt falling just below the knee. 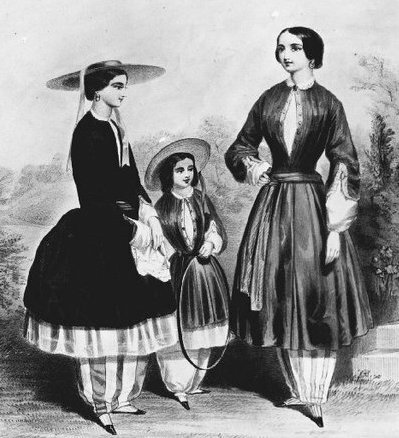 Preserving Victorian decency while being less of a hindrance, the new outfit was popular with nonconformists of the era and was adopted at other socialist communities. In a letter dated May 7, 1854, Mary Paul, a former textile worker, wrote to her father in Lowell, Massachusetts: “...I must prepare to go to my dinner now. We have one hour, from 12 to 1, for dinner, breakfast from 5 to 7, tea from 6½ to 7½. After dinner from one till quarter past two I do my work in the dining hall…The place is very pleasant and the people are remarkably kind. Upon the whole I think that I may like very well after I get used to the strange ways. That which seems oddest is the manner in which the meals are conducted...”2 Although Mary Paul did not reveal what she found odd about the food service, visitors reported that the atmosphere was relaxed and genial, with small tables arranged along the sides of the dining room, allowing families to eat separately. During its final, uncertain years, the Phalanx made a small retreat toward capitalism, adopting a restaurant model to provide a wider variety of food and better cost control. 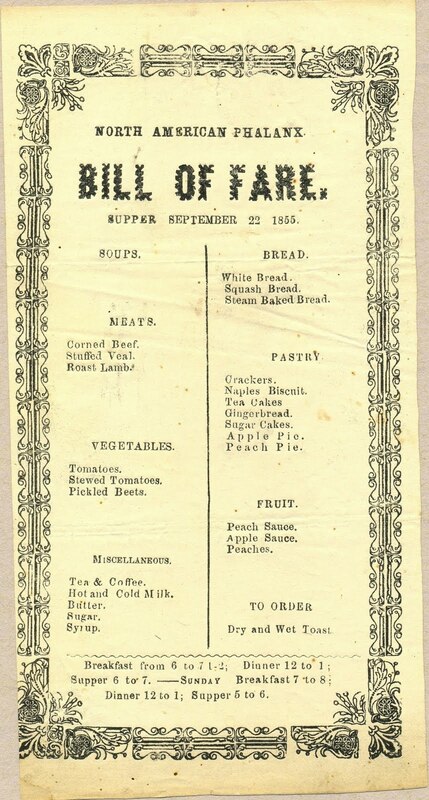 Menus like the one shown below from 1855 were printed and placed on each table before every meal.3 Since the à al carte menu did not show prices, metal checks were provided with each dish. The checks were later collected so that the bill could be calculated and recorded in the debit account of the diner, down to a fraction of a cent. In keeping with the low wages, the cost of food was very low. In 1852, a serving of meat reportedly cost two cents, as did a piece of pie, and coffee was only half a cent per cup. The new system of printing menus was an attempt to bolster morale. In the 1850s, a number of political disputes surfaced over women’s rights and the abolitionist movement. There was also a contentious proposal to adopt a religious affiliation. 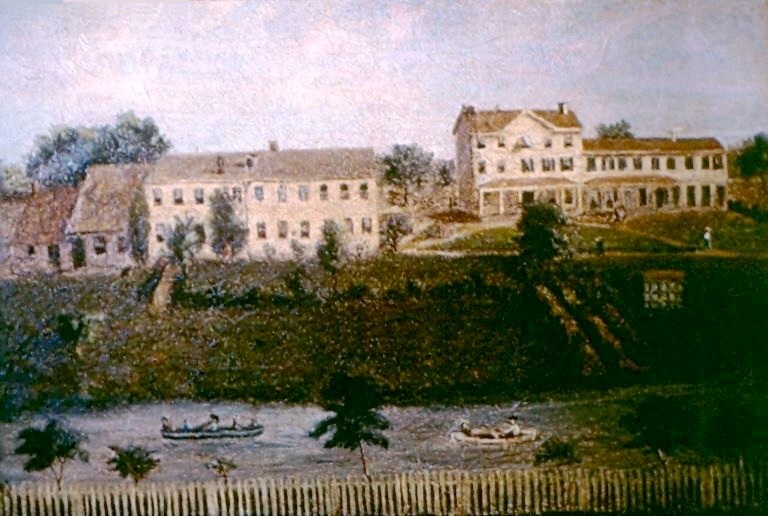 In 1855, the members voted to disband after their insurance company failed to make good on a claim for the mills that were destroyed in a fire. 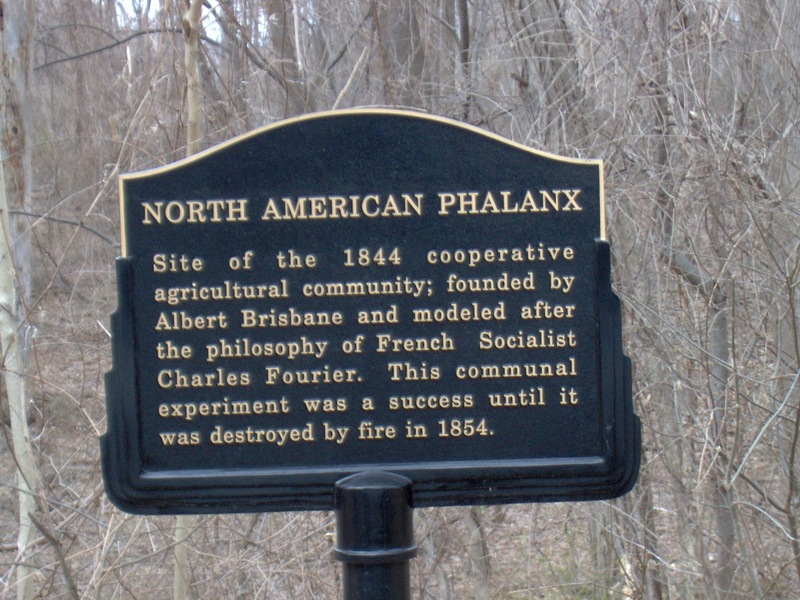 When the community ceased operations the following year, Horace Greeley lamented that if the Phalanx could not make it, “there was no hope for any other.” The Phalanxery stood until 1972, when it too was destroyed by a fire. 1. Fourierism was a form of socialism based on the theories of French philosopher (François Marie) Charles Fourier (1772-1837) as interpreted by the American theorist Albert Brisbane (1809-1890). Derived from the Greek word meaning a "line of battle," the word "phalanx" was used to suggest that its members work in close association with one another. The term "associate," or "associationist," referred to associative, or cooperative, living. 3. 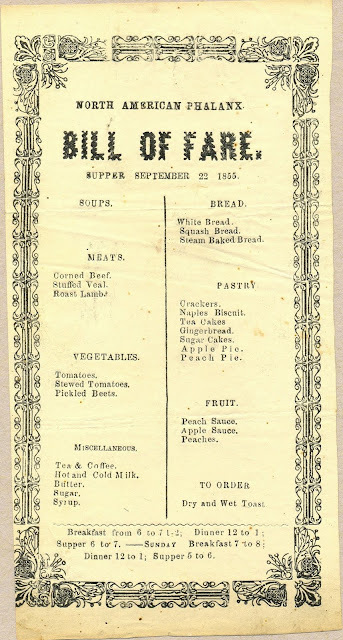 In addition to this supper menu, there are four menus from 1854-1855 in the Monmouth County Historical Association Library. 4. 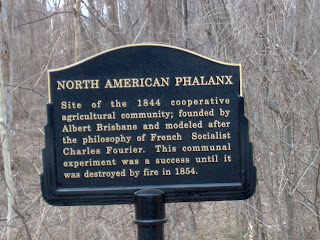 Of the forty Fourierist communities, only three lasted more than two years; the other long-lived phalanxes were Brook Farm (1841-1847) in Massachusetts and the Wisconsin Phalanx (1844-1850). Some of the others included the Sylvania Phalanx, the Trumbull Phalanx, the Integral Phalanx, and Le Reunion in Texas. 5. 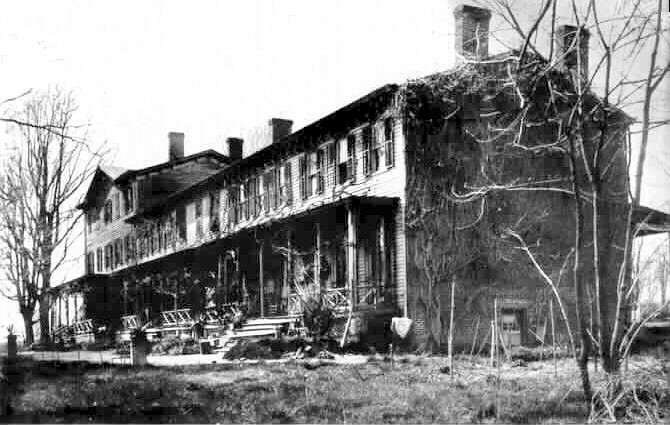 By traditional accounts, the Van Mater family who owned the farm thought it would be a good idea to own a hundred slaves, a goal was repeatedly frustrated by the death of their slaves. New York Times, 22 June 1913. 6. As a result of its process of gradual emancipation, New Jersey allowed slavery until 1840. Robert P. Sutton, Communal Utopias and the American Experience: Secular Communities, 1824-2000 (2004).